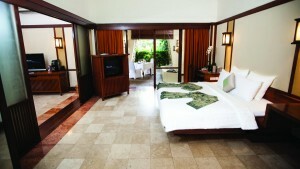 Novotel Bogor Hotel, a retreat from the heart of Jakarta and reachable in only 50 minutes from the city. Set on the foot of many mountains and its fresh air makes this hotel one of the most popular holiday hotel in Bogor, Indonesia. It just 30 minutes to Puncak. The Novotel Bogor Hotel is surrounded by 5 hectares of tropical gardens, situated in the quiet Bogor Raya Golf Estate and adjacent to the area’s most prestigious 18 holes golf course. 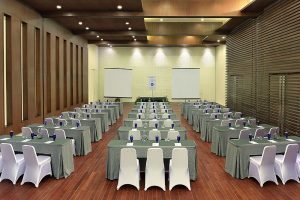 The hotel features a convention center with 20 function rooms and 2 ballrooms with a total of 1400sqm of meeting space, this together with its possibilities of the huge garden areas makes Novotel Bogor the ideal venue for meetings, banquets and weddings. This hotel offers 2 restaurants, 1 lounge bar, resort facilities, such as free web corner, free WiFi, outdoor pool, pool bar, kids club, children playground, tennis court, fitness and spa.